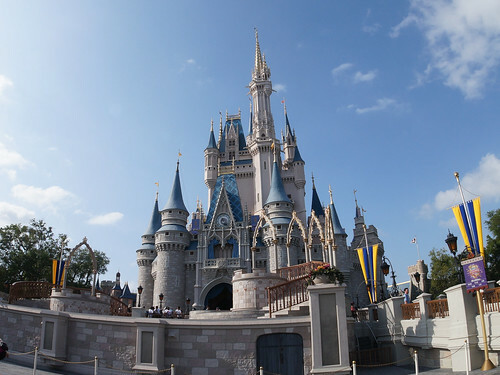 Joined family in Orlando for a trip to Disney World and the 2018 McDonalds International Convention. Last such family trip to Disney World was in 2006 so it had been a while, and there are many more of us now: total group size was 13. Very happy that the rest of the family finally got to meet Ezra, especially Dad, who had not met his grandson yet. 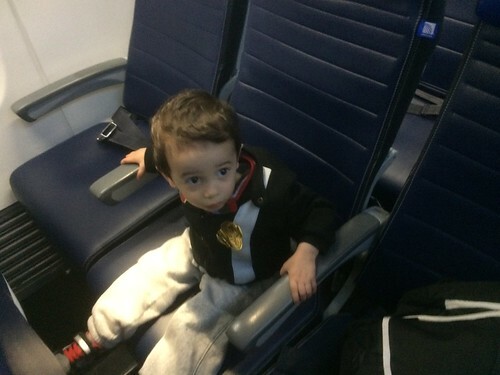 Ezra’s second plane ride ever, first one where he has his own chair. Late night flight so he slept through most of it, including landing. Rental car was outside airport and needed a shuttle, not an enjoyable experience that late. Slept overnight at Best Western Convention Center where rest of family was staying before checking in to our intended Disney World resort the next day, Disney’s Saratoga Springs. 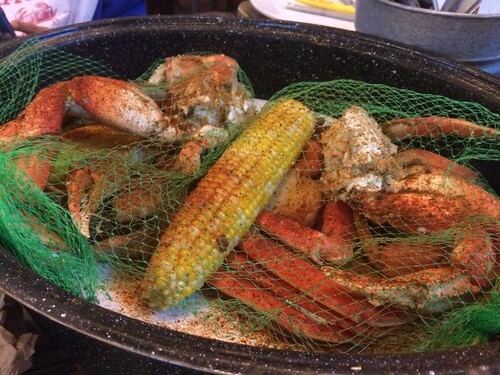 Hotel transfer plus family at convention center meant no time to visit any theme parks yet; but we ate at two “Shacks” with Mom today: Shake Shack for lunch and Joe’s Crab Shack for dinner. 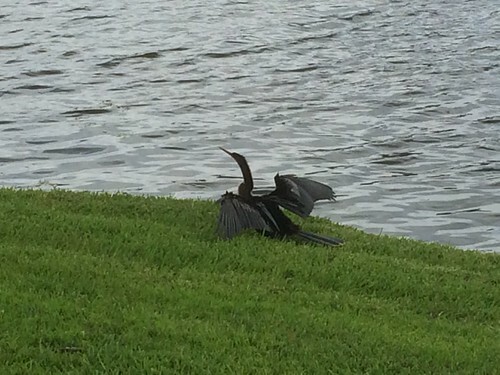 Also spent some time at Vineland Outlets and the nearby Publix. Amy stayed home with Ezra for dinner so he wouldn’t be up past his bedtime; she tried ordering a pizza to the resort room. It took an hour and cost $30 (after tip). 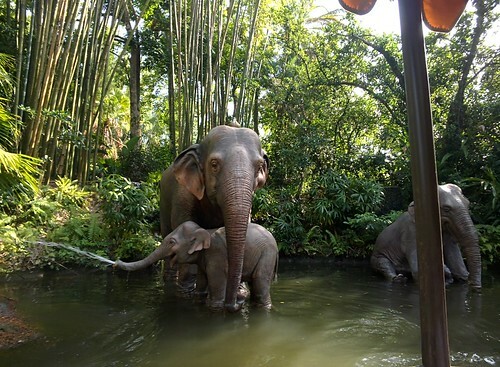 Plan for our first real Disney day: Disney’s Animal Kingdom, with a midday break to visit the McDonald’s Convention Open Floor. Morning did not go well. 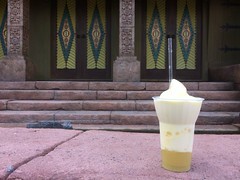 Late start as always with baby, then lost MagicBand (really hating those) led to confusing conversation with shopkeeper outside entrance gate which led us to believe we would have to return to resort front desk for replacement. 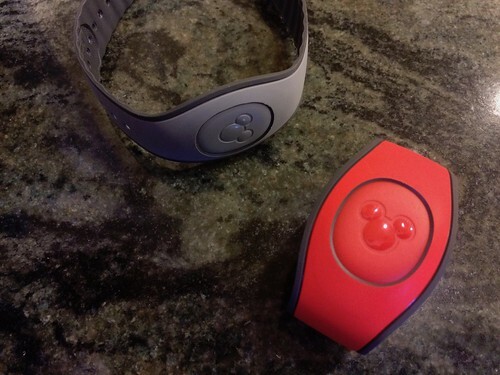 Only halfway back did we learn we could purchase replacement MagicBand at park entrance. 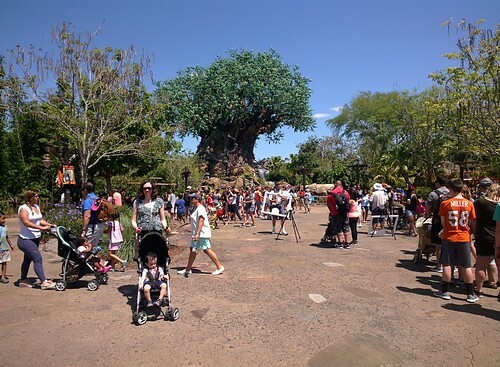 Re-parking at Animal Kingdom hampered by cascades of people who cannot park between lines. Almost noon by the time we got inside the park, only time for a quick walk through Gorilla Falls Exploration Trail, lunch at Harambe Market (predates the Cincinnati Zoo’s late gorilla), and a stroll through Pandoraland before it was time to head for the Convention Center. 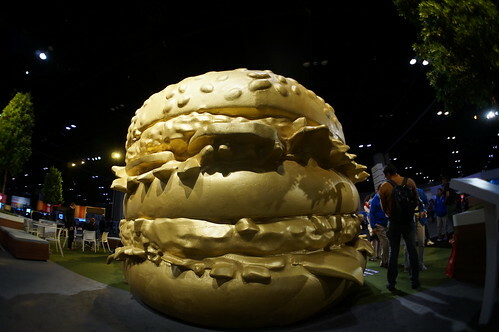 At the McDonald’s Convention we picked up some assorted freebies, sampled some burgers — and the fabled Szechuan Sauce — and got pictures in front of the giant gold Big Mac. 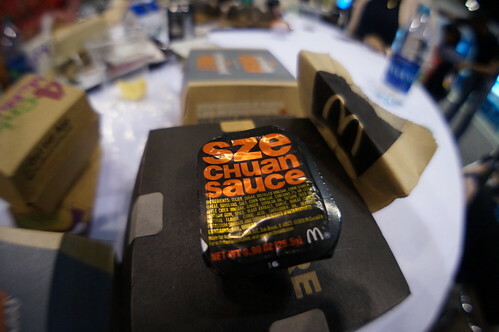 I brought along my fisheye lens. 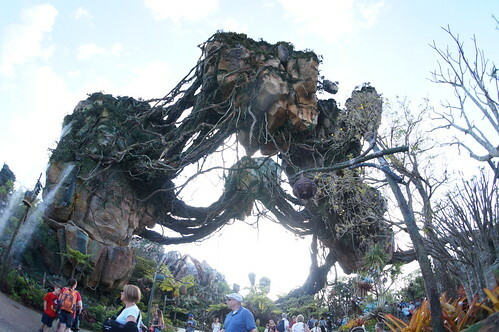 Returned to Animal Kingdom’s Pandoraland for the early evening, tried to ride Flight of Passage, but with a baby we would have had to do a ride swap, and they don’t allow lining up together with the child; one of us would have had to wait outside for two hours while the other lined up, then the second rider would receive Fastpass entry to go in after swap. Didn’t want to make Amy wait with Ezra while I lined up for two hours so we just opted for Na’vi River Journey — aka “It’s a Small Pandora After All.” Great effects, despite Avatar’s “noble savage” bourgeois-tribal aesthetic. Rode Kilimanjaro Safari by twilight and saw lots of animals: giraffes and longhorn cattle came close to us. Interesting lighting effects in the trees to simulate savannah sunset colors. 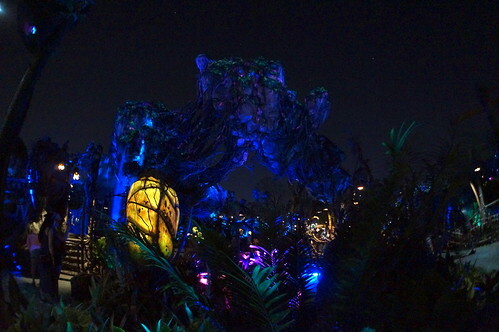 Had a light dinner of falafel with a view of the Tree of Life at sunset, then walked a bit more through Pandoraland to see the night effects before heading back to resort to get Ezra in bed. Better start to the day than previous, and Ezra was fascinated by the monorail. 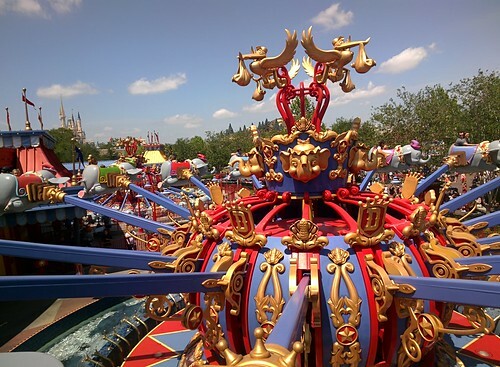 Spent most of this visit in Fantasyland, on toddler-friendly rides. 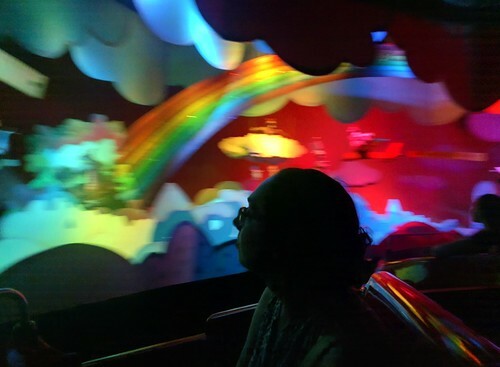 Peter Pan ride had a long line, always worth it, with interesting new interactive queue features like a shadow wall with phantom bells and projected Tinker Bell cameos in various rooms. Had fun pointing out characters: “Look, it’s Wendy and Michael and John! It’s Captain Hook and Mister Smee! And the Lost Boys! And the Problematic American Indian Stereotypes!” Ezra comprehended none of this because it was nap time and he was really sleepy. 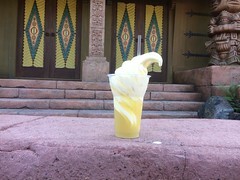 While Ezra napped peacefully in his stroller we made our way to Aloha Isle in Adventureland to snack on Dole Whip Floats. I had two. Early dinner at the Starliht Cafe hole serenaded by an animatronic alien, “Sonny Eclipse.” Then back to Small World to ride once more with the entire family, which Ezra didn’t mind at all since he enjoyed the ride so much — and my parents enjoyed seeing him dance to the music. 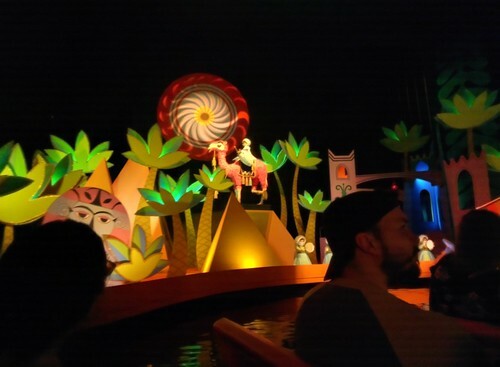 This second time around we managed to find the single animatronic figure representing the Philippines, placed near the end of the Pacific Islands region of the ride. 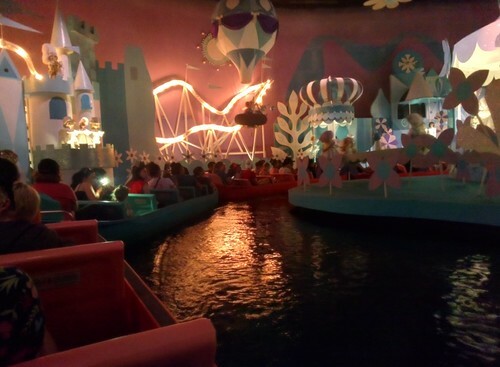 Forgot to get a photo so instead here’s the Small World traffic jam we got to enjoy towards the end of the ride. As crowds gathered to watch fireworks we hopped on The Little Mermaid ride, which had no line. Was a bit disappointed by this ride; good effects in spots but wow, animatronic Ariel kinda freaked me out. We’d wanted to ride the Prince Charming Carousel as it had a historic connection to New Jersey but sadly the ride was closed while fireworks were about to start, and we wanted to be out of the park before the show. 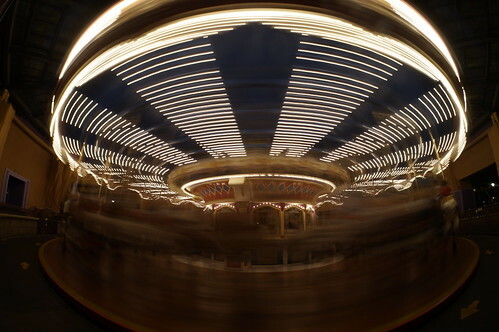 Paused long enough to get this cool long exposure of the spinning carousel, at least. Got out of the park and beat the fireworks crowd, and rode the ferry boat back to parking rather than monorail. Didn’t get to do a lot of stuff I’d wanted owing to crowds and baby limitations, but hopefully we’ll be back when the kid’s old enough to enjoy thrill rides, one day. 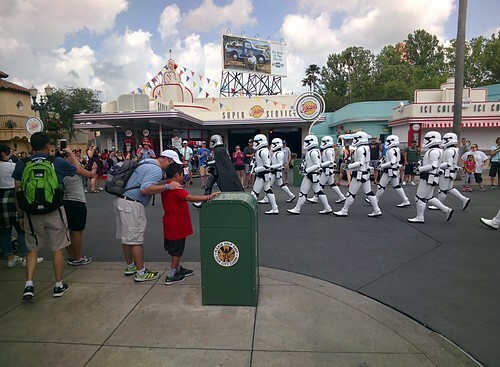 Really didn’t do much at Hollywood Studios other than see a stormtrooper procession and ride the new randomizing Star Tours. (Same deal with rider swap here as elsewhere: no waiting together, first rider gets a Fastpass+ badge to give to second rider at exit. 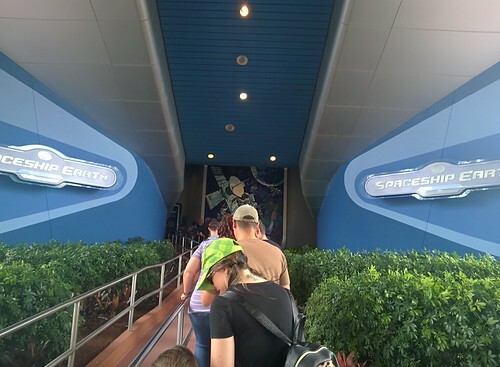 This worked better for us than at the Flight of Passage ride at Animal Kingdom because the wait here was just 30 minutes as opposed to 2 hours. I rode with my brother and then Amy rode with our sister-in-law.) For our trip we got the Kashyyyk and Coruscant scenarios, while Amy got Hoth and Coruscant. 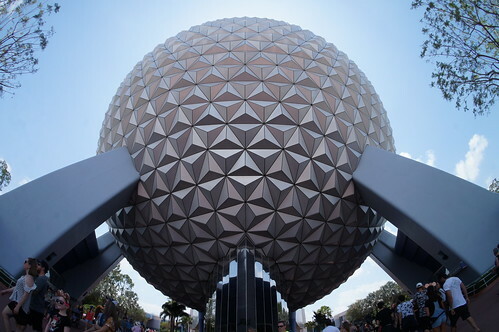 We then drove to nearby Epcot, pausing for a bit at the entrance to get wide angle shots of the big golf ball. First stop: Imagination. I’ve ridden this iteration of the attraction once before, but it hit me harder this time how inferior the “Imagination Labs” update is compared to the wonder of the original “Dreamfinder” experience. 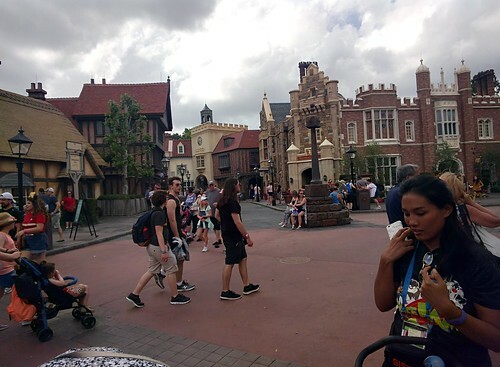 We had fish and chips for lunch at the World Showcase United Kingdom pavilion. Commented a bit on how the cast members’ British accents were incredibly posh-sounding and wondered they were just American cast members affecting Oxford English, but I’m told World Showcase pavilion staff are generally from the countries represented. 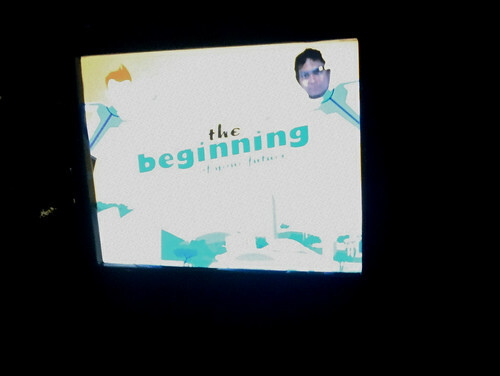 Next up: Spaceship Earth. Always been a fan of Epcot’s signature dark ride, now narrated by Dame Judi Dench. Up at the very top of the dome the ride came to a temporary stop, and we got to float in space by the light of the Earth for 5 minutes, very peaceful and calming. Then, on the way down, I did the interactive “future you” touchscreen quiz and it showed “future me” wearing an augmented reality headset — over the somewhat-passé Google Glass I was already wearing on the ride. Not only had the future caught up with the ride’s own interactive feature, the technology had even had time to become obsolete. From there we walked into The Seas. Last time we were here most of the attraction was under construction with only a small area of the aquarium viewing area open; now the old “hydrolators” are gone and the dark ride is back with a “Finding Nemo” story before arriving at the re-themed aquarium. 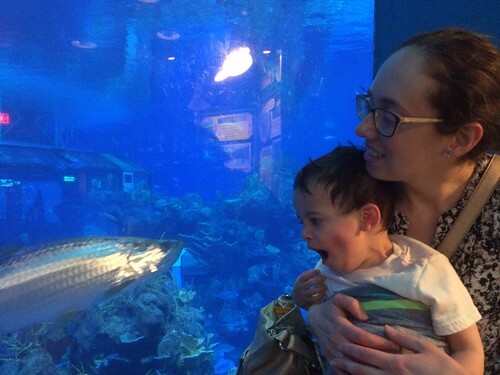 Ezra had fallen asleep back on Spaceship Earth and napped through most of The Seas, but he woke up in time to yawn at a fish. From the Seas we ascended to The Land. Ezra was still too short to ride on Soarin’ so I kept him company while Amy joined my family on the ride. He had a lot of fun just going up and down the escalators. Repeatedly. After this there was almost zero wait for the hydroponic farm boat ride so we did that. 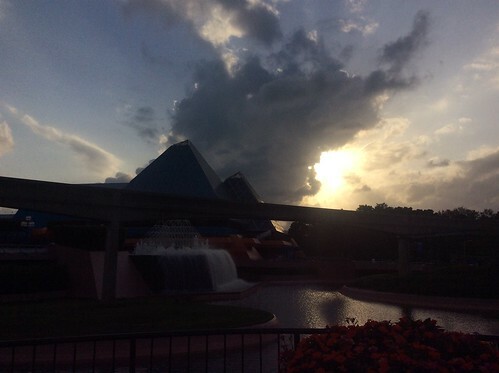 On the way out there was a nice view of the Imagination pavilion backlit by the afternoon sun. Checked out of hotel, walked with brother and nephew to Disney Springs (formerly Downtown Disney) for a lunch of oysters and sandwiches at The Boathouse. 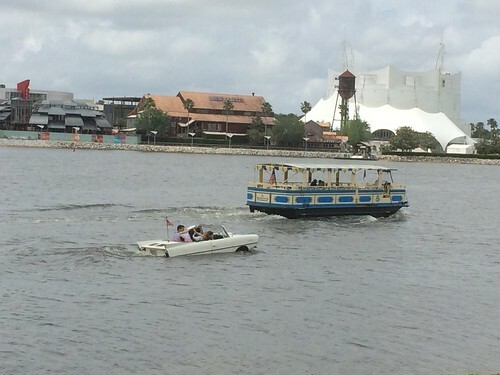 Spotted an amphicar and a cormorant. Then we piled into the rental car to return it and head to the airport for our flights, my brother to visit NJ and us back to DC. Ezra blessedly slept the whole flight home. 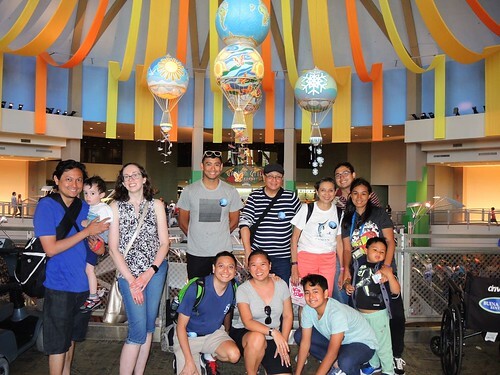 I kept my Disney expectations low; we were doing this trip with a 1 year old baby and a family of 13 people in a span of 4 days so we took it easy, didn’t try to do too much all at once, and prioritized family time. Park days started late and ended early with ample breaks for meals and naps, and we skipped most thrill rides. MagicBands were a real pain this trip, related to having two separate reservations under my name, plus misspellings of some guests’ names leading to desynchronization from the online family list I’d built in my Disney account. Took a couple of mornings straightening things out with the front desk to fix all my MagicBand issues. Later on I would discover that using my MagicBand to unlock the second room would lock me out of the first one. I also did not learn until two days later that our resort stay entitled us to free parking and I just needed to swipe my MagicBand at the gate. Additionally the bands came off extremely easily, especially when sharing a wrist with an existing watch. After all this and the mess we had on our first day, I’ve decided MagicBands and the My Disney Experience app are my archnemeses and destroyers of Disney Magic. Still, fun trip overall, and the most important part was that we got to spend time with the whole family. 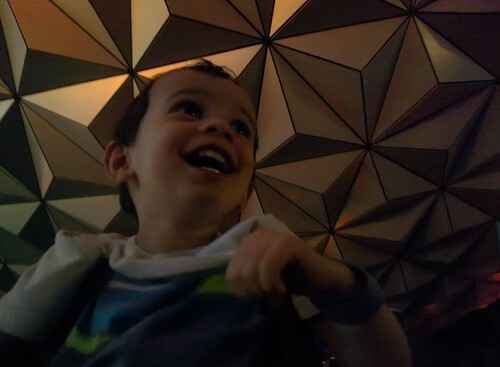 Ezra’s favorite Disney World attractions were (1) the resort elevator, which he rode up and down repeatedly, (2) the escalators at The Land, which he rode up and down repeatedly, (3) every single ceiling fan (“FAN”), and (4) Small World. He was thankfully able to nap well in his stroller, enjoyed dark rides, and wasn’t picky about food. 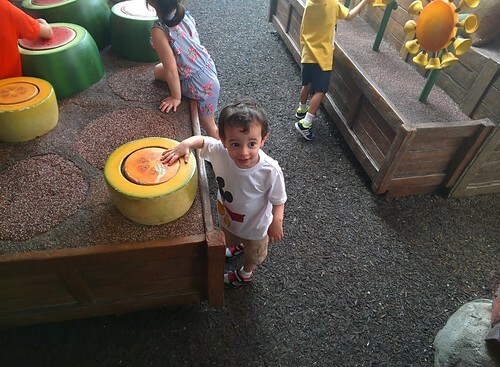 I’m looking forward to returning in a few years when Ezra’s old enough to have seen more Disney cartoons and enjoy more action and thrill rides. Full trip photo album here and POV videos from my glasses here.